Friday, March 6 1908 -- Herriman takes a little vacation from his now customary place on the sports page to post cartoon commentary on the Pacific Furniture & Lumber Company case. The lawsuit contends that the company was defrauding the government by paying individuals to apply for land claims in the western states. Once the operatives were granted settler claims, they would transfer ownership of the tracts to the company. This afforded Pacific Furniture large tracts of land (and hence vast amounts of lumber on the hoof) in Oregon and California for a very small outlay. In the 1910 census, the family lived in Civil District 7, in Davidson County, Tennessee, on Hillsboro Road. His father was a professor at Vanderbilt University. On September 12, 1918, he signed his World War I draft card. He lived in Jacksonville, Tennessee. His occupation was foreman at the Dupont Engraving Company. His description was medium height and weight, with blue eyes and blonde-brown hair. Martin named his father as his nearest relative, who lived at 403 North 9th Street in Monmouth, Illinois. The 1920 census recorded the Martin family in Monmouth at 813 East Broadway. His father was a college professor. The Advocate said: "As a freshman Martin used to draw grasshoppers, lizards and frogs in his father's biology classes. He quit in his junior year to enter the Academy of Fine Arts in Chicago. He joined Newspaper Enterprise Assn. in 1921." In 1922 he created Efficiency Ed. Later that year he drew The Nut Brothers. An Ancestry.com family tree said he married Mary Margery Armsby in 1922. 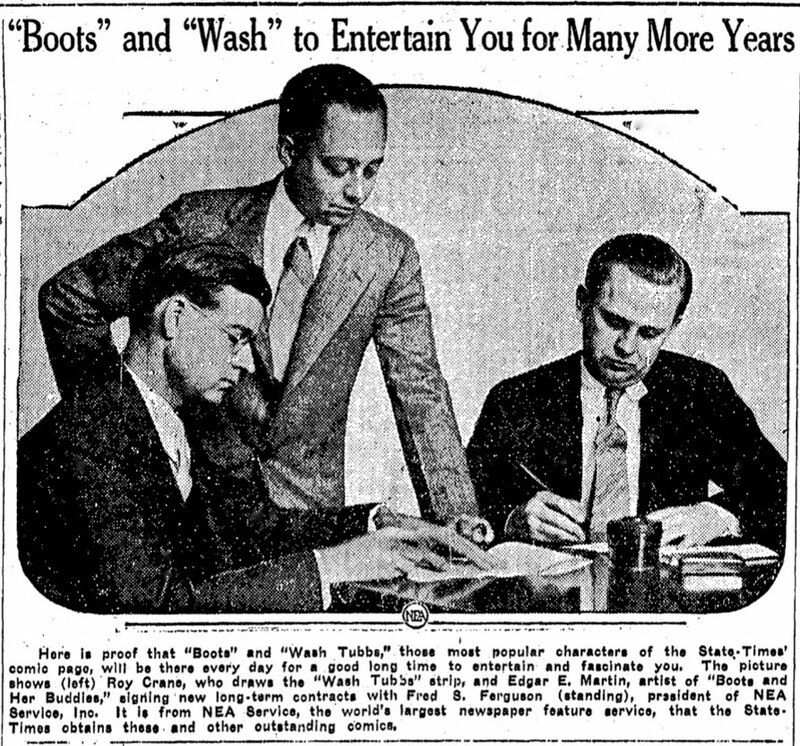 Editor & Publisher, February 26, 1949, said: "Martin landed with NEA in 1921 when he was 23. 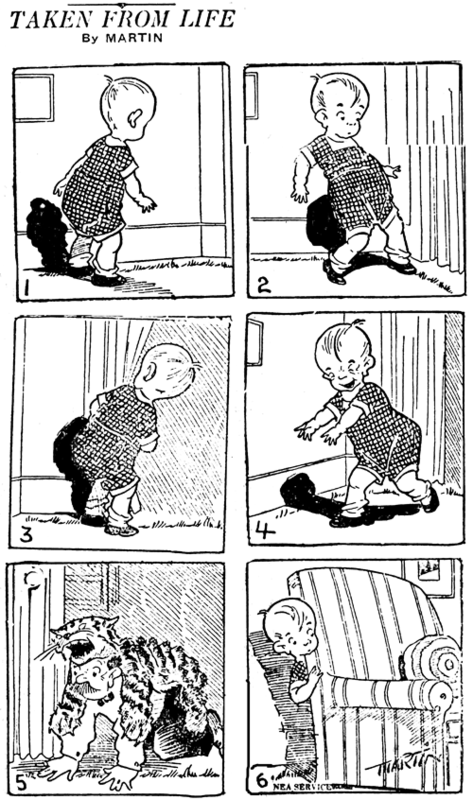 He drew several comics without much success until 1924 when NEA asked several artists to submit strips for a girl comic. Martin in off hours created Boots [and Her Buddies], submitted the idea, unsigned, and the board of judges picked her." Boots and Her Buddies began on February 18. In 1930 Martin lived in East Cleveland, Ohio at 1868 Chapman. Two daughters were part of the family. His occupation was newspaper cartoonist. He signed a long-term contract with the NEA in 1930. 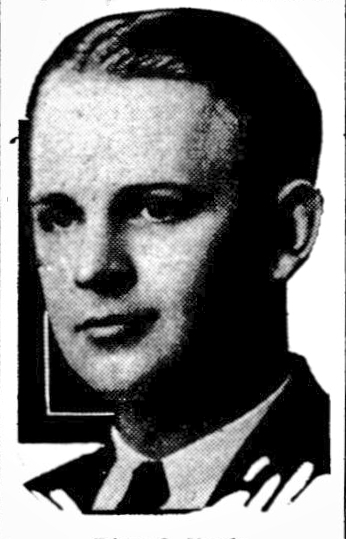 The Independent (St. Petersburg, Florida), March 15, 1934, reported the Martin family's vacation in Florida. Wikipedia said he moved to Clearwater, Florida in 1940. According to the 1945 Florida State Census, his family lived in Pinellas County at 1500 Maple. His education included college and his occupation was artist. The Independent, February 18, 1949, published a profile of Martin on the 25th anniversary of Boots. Martin passed away August 30, 1960 in Clearwater, according to various newspapers including the New York Times, September 1, and the Advocate. 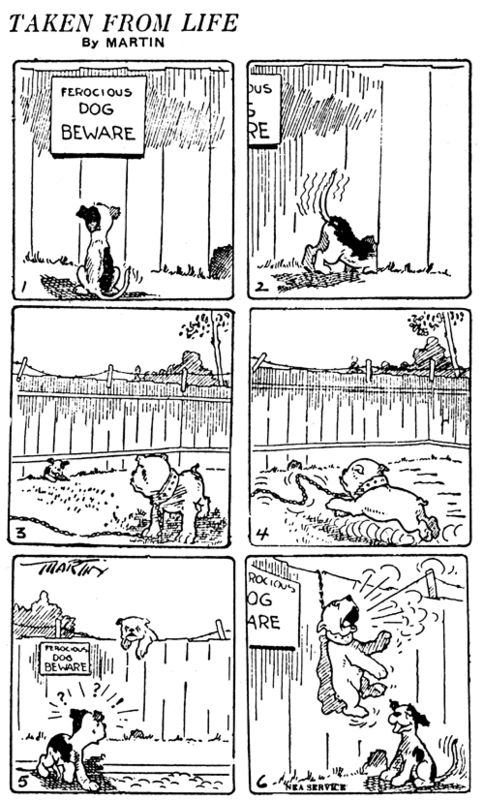 Wikipedia and Comic Strip Artists in American Newspapers, 1945-1980 (2003) said the date was August 31. 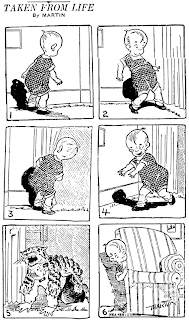 Comic Strip Artists said the Sunday Boots was turned over to Leo Carroll, Martin's assistant. Just a note -- The 2/22 was evidently published with the last two panels before the first. Since this (and other) strips were designed in two neat halves to stack if desired, I'm guessing this sort of thing happened in a lot of composing rooms. Edgar Martin was still trying to find his niche at NEA as the syndicate published his third feature, Taken from Life. 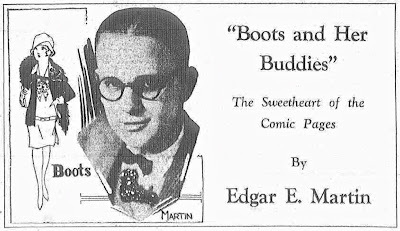 After the self-limiting Fables of 1921, and the good but short-lived Efficiency Ed, Martin tried his hand at pantomime. As any cartoonist who has tried will tell you, doing a daily pantomime feature is one of the hardest tasks a cartoonist can undertake. Trying to tell a story without words, and make it funny to boot, is no mean feat, and doing it six times per week puts your creativity to a Herculean test. For the young and inexperienced Martin, it was a bridge too far. The typical Taken from Life strip didn't work well as a story, or failed to be humorous, or both. 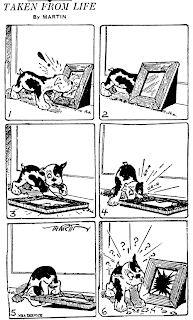 It's almost painful to look at the strips, because as we know from his later work, Martin was a good cartoonist, just not ready or suited for this strip. Sadly, Taken from Life did not have an abbreviated lifespan like Martin's other early misfires. It began on July 24 1922 and ended February 16 1924, almost two years of uninspired awkwardness. Thankfully it was replaced by Martin's great success, Boots and her Buddies, with which he thrived for decades. 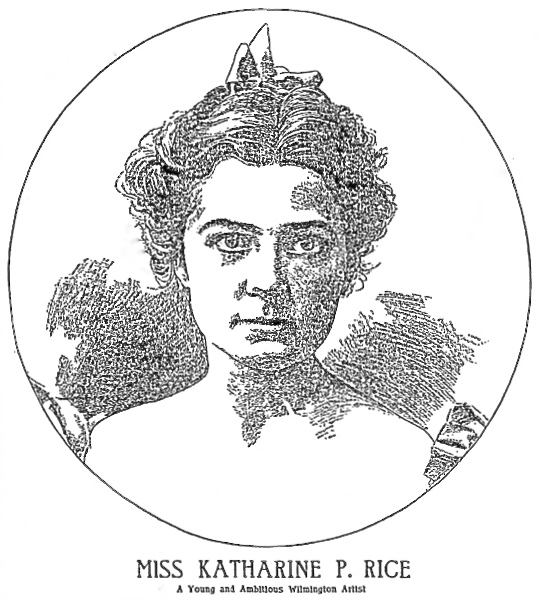 Katharine Patterson Rice was born in Delaware on December 2, 1878. Her full name was recorded on her marriage certificate, which is in the Delaware Marriage Records, 1806-1933 at Ancestry.com. Her birthdate is based on three records: she was listed in the 1880 U.S. Federal Census; the 1900 census had her birth as December 1878; and the California Death Index, 1940-1997 has the date as December 2, 1882. In the 1880 census, she lived with her mother, Mary, and younger sister, Bessie, in Wilmington, Delaware at 307 West 12 Street. Her maternal grandfather was the head of the household. 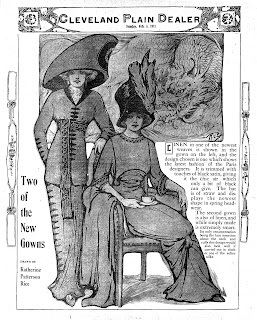 The Philadelphia Inquirer (Pennsylvania), December 25, 1898, mentioned her in the "Wilmington Social Notes" column which included a portrait (below). 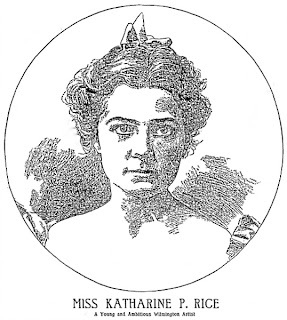 Miss Katharine Patterson Rice was sitting by the desk showing some of her drawings. Miss Rice has shown that she has a decided talent for pen and ink sketches. The clever little heading in the Every Evening here and used over the articles signed "Portia" was drawn by Miss Rice. 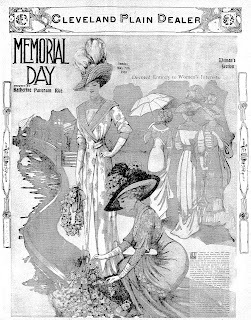 The Inquirer, May 7, 1899, reported the Wilmington Dramatic Club's play, "Married Life", and said, "…Miss Katharine Patterson Rice, who takes a leading part in the play and is an artist of no mean ability with her pen, has designed a sketch for the frontispiece of the program…"
The 1900 census recorded her at the same 1880 address. Her architect father, Edward, was head of the household. She was an "artist painting". The book, Samuel L. Schmucker: The Discovery of His Lost Art (2000), has the most biographical information on Rice (pages 153 to 162). According to the book she was enrolled, from 1902 to 1904, at the Pennsylvania Academy of the Fine Arts, and listed in Wilmington city directories as an artist from 1906 to 1922. She met Samuel Schmucker at the academy; after two years there, he studied at the Howard Pyle Drexel Institute for a year. He lived in Philadelphia but also had a Wilmington address in 1908. According to the 1910 census, Schmucker was a boarder at Rice's home in Wilmington. While he produced postcards, her fashion drawings appeared on the covers of newspaper supplements in papers such as the Cleveland Plain Dealer and Colorado Springs Gazette. 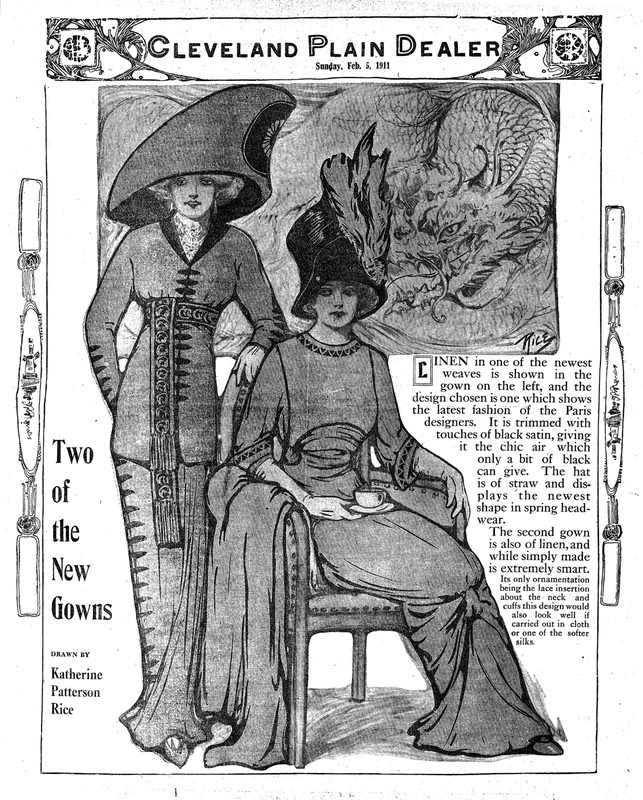 The Evening Tribune (Providence, Rhode Island), published her drawings in its February 13, May 15 and July 24, 1910 editions. 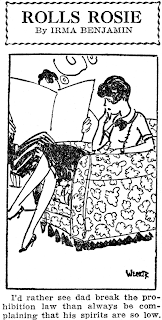 Her comic strip, Flora Flirt, was published in the Philadelphia North American beginning February 23, 1913. Rice and Schmucker were married October 27, 1917, in Wilmington, according to their marriage certificate, which said they were 36 years old. On September 12, 1918, he signed his World War I draft card. His birth date was February 20, 1879. The couple lived in Manhattan, New York City, at 5 East 40th Street. He was a freelance artist. As "Katharine Schmucker", she was mentioned twice in the Pennsylvania Museum and School of Industrial Art, Forty-second Annual Report 1918. The annual commencement was on May 23, 1918 and she received an honorable mention for the Miss Mary E. Sinnott Prize—For Mosaic, and a School of Industrial Art certificate for the Industrial Drawing Course. Schmucker's wife should not be confused with his first cousin, Katharine Muhlenberg Schmucker (1884–1966), who was an artist, too. As "Katharine Schmucker" in the 1920 census, she was a boarder at the Easton Sanitarium in Easton, Pennsylvania. The Schmucker book said he was "vice-president of Robert Hoyme, Inc., an advertising/merchandising agency at 150 West 57th Street, N.Y." Schmucker died of heart failure on September 4, 1921, and was buried in the Charles Evans Cemetery in Reading, Pennsylvania, his hometown. Rice has not been found in the 1930 census. According to the Schmucker book, she was mentioned in her mother's 1932 obituary and was a San Francisco resident. City directories, for 1932 and 1934, had her address as 433 Powell Street. Rice’s father passed away January 28, 1933. Rice was recorded in the 1940 census living in San Francisco at the Hotel Victoria, 598 Bush Street. The Schmucker book said the Victoria Hotel was her last known residence. Rice passed away September 23, 1955, at the Alexander Sanitarium in San Mateo County, California. She was buried at the family plot in Wilmington. The breakout hit feature Flapper Fanny by Ethel Hays spawned quite a parade of pale imitators. By the late 1920s, any newspaper that didn't yet have a dim-witted young beauty making daily commentary was strictly behind the curve. One of the least of these was Rolls Rosie, by writer Irma Benjamin and artist Harry Weinert. 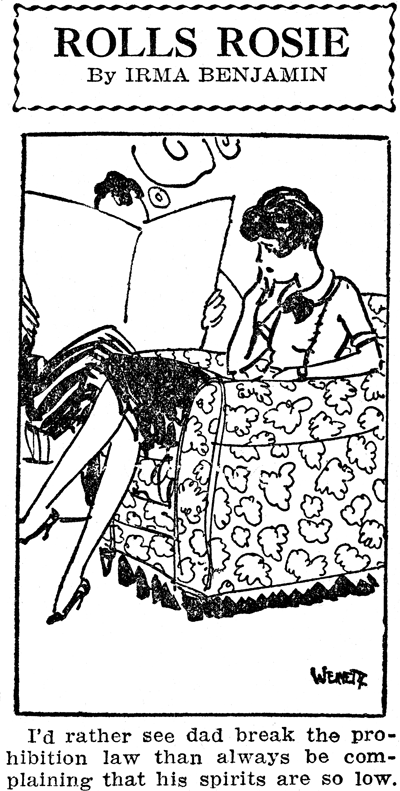 Syndicated by Philadelphia's Public Ledger Syndicate, it seems to have been either a replacement or a companion for Marjorie Henderson's panel, The Boy Friend. Rolls Rosie began sometime in late 1926 (earliest I've found are from December), and The Boy Friend has been seen later than that, so seemingly one was not a replacement for the other. However, these two features were run by most papers on a space-available basis, so the overlap might be illusory. The Ledger folks couldn't fit this feature into one of their own papers until January 1927, and then it was in the lowly tabloid Sun. Rolls Rosie ran in a small complement of papers, and a rare paper it was that used it on a daily basis rather than strictly as an occasional space-filler. However, evidently enough papers took the feature to keep the Ledger Syndicate happy, for a while at least. 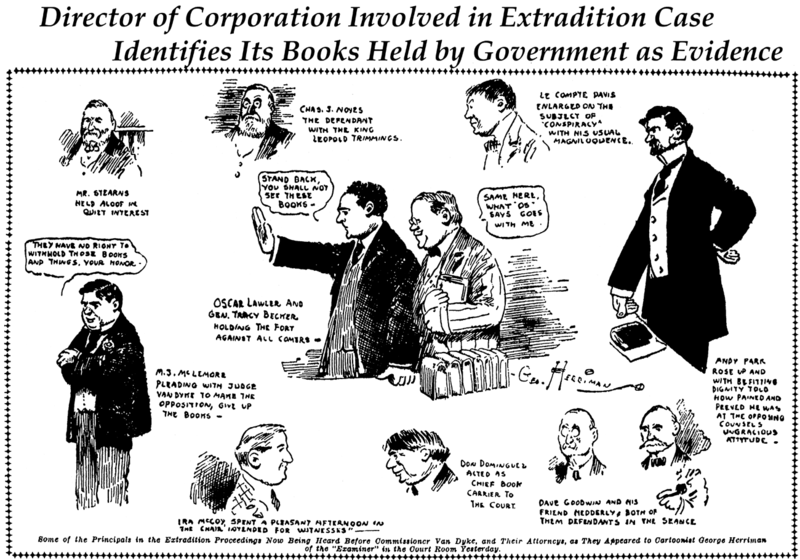 The panel continued to be offered by the syndicate into 1928, but then sometime in 1928-29 it switched over to the Iowa-based Register and Tribune Syndicate. The exact date on which this change occurred is unknown, again because of the dearth of papers that ran the feature consistently. When Rolls Rosie motored over to the new syndicate, the art by Philadelphia-based Weinert was dropped in favor of Frank Ellis. Ellis was a hard-working R&T man who already had two other features for which to provide art, Jane Arden and Parking with Peggy (the second yet another Flapper Fanny wannabe!). Apparently the anemic sales that had satisfied Ledger weren't good enough for R&T; either that or poor Frank Ellis waved the white flag on being asked to handle the art on yet another feature; because Rolls Rosie does not seem to have lasted until the end of 1929. "ROLLS ROSIE" is a real oddity, basically centering on not a guy, but a girl's attitude toward automobiles. The only other strip like this I can recamember is another Ledger Syndicate item, "CARRIE AND HER CAR" by Wood Cowan. David Horsey began honing his craft of editorial cartooning at the Seattle Post-Intelligencer in 1979, and was eventually the recipient of two Pulitzers (so far), in 1999 and 2003. 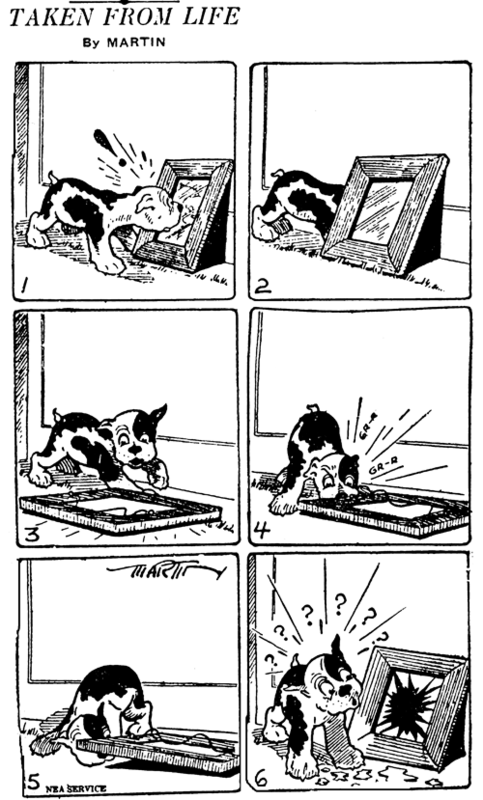 But like most op-ed cartoonists, he also gamely tried out his luck with a syndicated comic strip. January 6 1986 saw the debut of Boomers' Song from Tribune Media Services. The strip was a look at life for baby-boomers, hence the name of the strip. In the 1980s, Baby Boomers were in their late-20s to late-30s, and the driving force behind the American economy and culture. The boomers came in for a lot of criticism, some self-imposed, for their egomania, their love of money, and their self-serving politics. When compared with the previous generation, the hippies, they seemed incredibly banal and self-centered. The cast, which is never really formally introduced as best I can tell, is a group of boomers, plus one former hippie, who all live in the small Woodstock Apartments complex. The large cast gives Horsey plenty of types to work with and lots of options for cast interactions. The problem is that it just never seems like Horsey had something really important to say about the boomers -- there seems no urgent need to connect with the reader. The better gags are like material from faux-edgy SNL skits, the lesser ones like the humor from a Family Ties episode. The same tired tropes about boomers are trotted out again and again to readers who were already bombarded with this sort of observational humor at the time. There's really nothing wrong with the writing, it just doesn't seem to be a subject in which Horsey has all that much interest, or the benefit of a unique viewpoint. In other words, I think the strip was conceived for its marketing potential, not because of any burning need Horsey felt to comment on his generation. On the other hand, Horsey does better when he tries out extended storylines, which gives the reader more reward than a lukewarm one-liner to encourage them to read the strip every day. And the best part of the strip, no question, is the drawing. 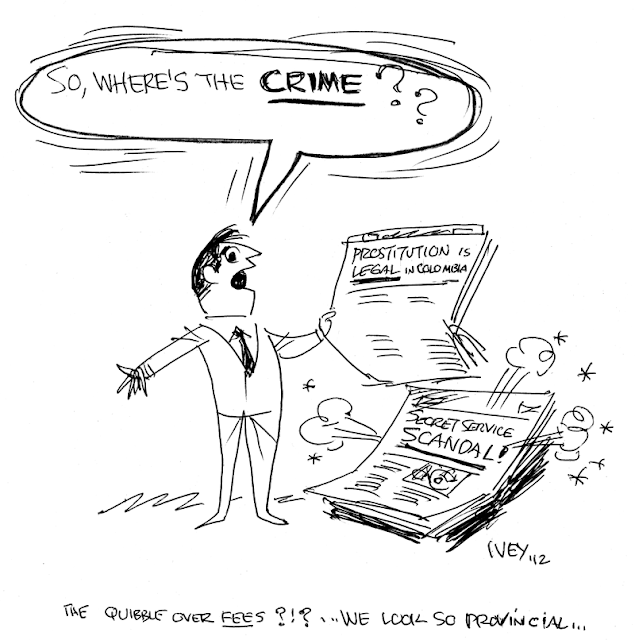 As anyone who is familiar with his editorial cartoons knows, Horsey is one heck of a cartoonist. I'd love to see some of Horsey's Sundays from the series, where he'd have some room to really shine, but unfortunately I've never found any in print, only reprinted (without color) in his book Greatest Hits of the '80s. Boomers' Song began as a daily on January 6 1986, a Sunday seems to have been added a tiny bit late, on January 19, and the strip ran until September 10 1989. 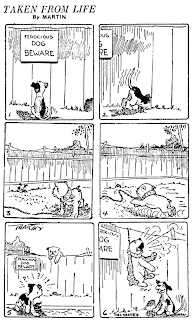 According to Horsey, who commented on the strip in Greatest Hits of the '80s, the strip never had more than 65 clients, and he was relieved when the strip was withdrawn from syndication. I used to read it when in the Seattle PI. It's been getting a lot of bad reviews, but hey, I liked it. Horsey's now doing editorial cartoons for the LA Times, getting the big audience he deserves. Most hippies also belonged to the Baby Boomer generation though. Baby Boomers are anyone born between 1946 - 1964. Some of the older boomers were hippies in their youth, but may have become yuppies obsessed with money and status when they got into their 20s and 30s. But they weren't separate generations. Where Horsey shines is in his characters' faces. One sunday "Song" was used in a book about facial expressions for the artist as an illustration. In the strip, a corporate Lothario is trying to make a move on one of the office women; over the space of six or so panels, she leads him on, slightly downward, toward a rather anticlimactic brush-off. The gag isn't that great, and the situations stereotypical and smack of an author who has no real affection for his topic, but watching the Lothario's facial expression deteriorate as the woman gradually, painfully, shuts him down is priceless: He starts with a dazzling, self-confident but blatantly insincere smile, targeting his supposed conquest with laser eyes. The smile stays on the mouth for a couple panels but the eyes and eyebrows go from dumbfounded to downright panicky until, by the last panel, he looks positively stunned and about as crestfallen as you can get with a phony smile just beginning to fall off your face. With all due respect, I think Mr. Ivey is missing the point of the outrage. It's not whether the Secret Service agents violated local laws by procuring prostitutes, it's that they jeopardized President Obama's safety by allowing them possible access to his secret itinerary.